Ever heard of the miraculous benefits of broccoli sprout juice that could fight cancer? This little-known juice is NOT “broccoli and sprout” juice. It is juice extracted from 3 to 5-day old broccoli shoots. Matured broccoli is one of the most nutrient-densed vegetables due to its cancer-protective compounds—particularly sulforaphane that has thousands of studies done on this specific nutrient! However, researchers have discovered that 3 to 5-day old broccoli sprouts contain between 10-100 times higher levels of sulforaphane than their full-grown counterparts! The studies show that just one ounce of broccoli sprouts contain an equivalent amount of sulforaphane to 1.5 pounds of mature broccoli! The very high sulforaphane content in broccoli sprouts is the main reason why people are drinking broccoli sprouts juice. But what really is this compound? Sulforaphane is a phytonutrient (plant nutrient) that belongs to a group of phytochemicals called isothiocyanates. Let’s take a step back to better understand this nutrient. Chemically speaking, the “mustard oil” (allyl isothiocyanate specifically) is the group of compounds that give cruciferous vegetables their unique, bitter taste and strong smell. You might know the smell when cooking cabbage, for example, that has that strong smell. Some people love it, some hate it—it’s a strong smell. And among these phytonutrients, there’s a compound called glucoraphanin that is the precursor to sulforaphane. So, there really isn’t sulforaphane in the vegetable. It is when the vegetable is cut, chewed or juiced (when the vegetable cell walls are broken) that the magical transformation take place. Glucoraphanin that is released comes into contact with an enzyme called myrosinase, reacts and produces sulforaphane, that is the miraculous healing property we seek. Among all vegetables, broccoli is the richest source of glucoraphanin, and the sprouts contain 10-100 times more! The magical sulforaphane compound has to be obtained only in its raw form as the enzyme myrosinase gets destroyed with high heat, thus will be unable to convert glucoraphanin into sulforaphane. We’ll talk about how to get even more of sulforaphane content from the same amount, later. Why Is Sulforaphane So Amazing? Sulforaphane is one of the most powerful detoxification compounds and antioxidants ever known to man. Scientific studies have discovered that adding sulforaphane to your diet is beneficial for many health issues and even cancer. Sulforaphane is so amazing because it boosts the amounts of a certain protein enzyme known as Nrf2 (Nuclear factor erythroid 2-related factor 2) enzyme. How this enzyme works is very complex and technical so we will not go into detail about it. This process stops diseases and cancer in their track, before they even start to grow, keeping your body free of diseases. Let’s look at what this really mean for the human body. Again, the reason why we want to drink broccoli sprout juice is for the amazing sulforaphane which can be found in the highest level in broccoli sprout juice when prepared properly. 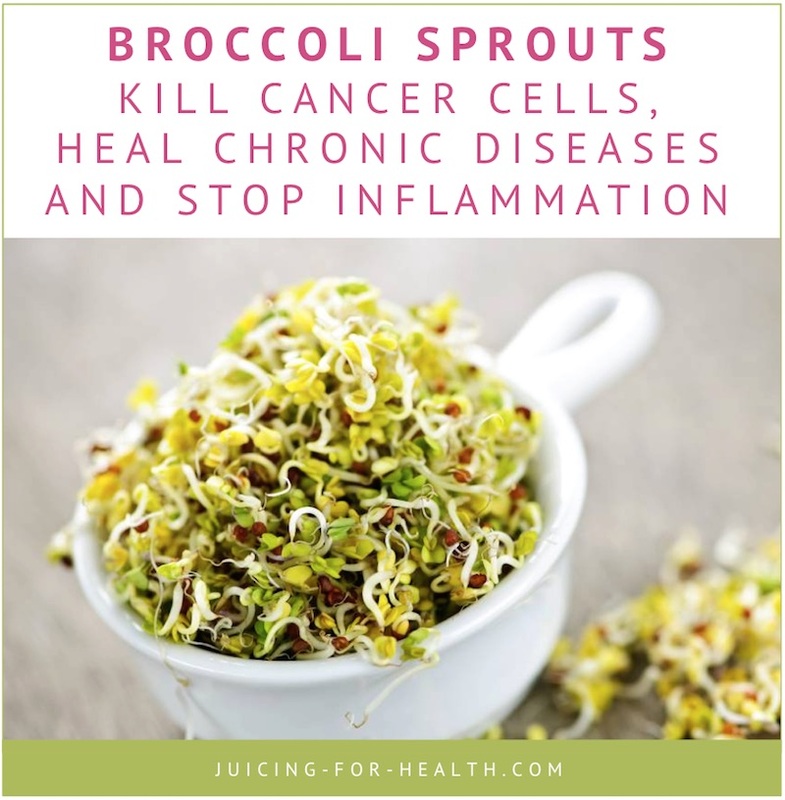 As with all natural healing foods, the beauty of sulforaphane in broccoli sprout juice is that it is able to seek out and destroy cancerous cells before cancer even have a chance to grow. Unlike conventional drug treatments, phytonutrients do not harm your healthy cells; they protect your DNA, and keep your immune system strong to naturally fight the disease. In a study from Johns Hopkins, sulforaphane stopped the growth of not one, but four, different kinds of human breast cancer cells. It also stops breast cancer from metastasizing and has been shown to have a chemo preventative effect on breast cancer. Sulforaphane helps the body detoxify airborne pollutants, pesticides and heavy metals, by activating the detoxification systems, mainly the Phase 2 enzymes. Protects against diesel exhaust particles, ozone, and tobacco smoke, reducing pro-allergic effects typically caused by these toxins. Blocks DNA damage caused by toxins that bind to DNA, such as aflatoxin and arsenic. H. pylori increases oxidative stress, causing damage to the stomach lining that eventually leads to gastric cancer. Broccoli sprout juice activates the Nrf2 enzyme activities, thus protects stomach cells from oxidative injury. In several human studies, broccoli sprouts decreased the colonization of H. pylori and reduced stomach inflammation. Improved stomach lining makes it less conducive for H. pylori to colonize the stomach, thus eradicating most digestive disorders caused by this bacteria. Caution: Note, however, sulforaphane may not be effective for infections by viruses that hijack the Nrf2, such as the Marburg virus, the Kaposi’s sarcoma-associated herpes virus (KSHV) and the dengue virus. Inactivates a protein complex (NF-kB) that is a key inducer of inflammation. Oxidative stress and cartilage damage are found in joints of patients suffering from arthritis. Consuming foods rich in sulforaphane is able to block inflammation, thus protecting joints and cartilage against destruction, and encourage tissue repair. Sulforaphane in broccoli sprout juice helps prevent various diabetes-related complications. Studies show that diabetics given broccoli sprout juice had increased blood antioxidant capacity, HDL cholesterol, decreased oxidative stress, and regulated insulin levels in the blood. As mentioned above, sulforaphane can reduce inflammation, and it’s found to also reduce inflammation in the brain. Insufficient Nrf2 activation in humans has been linked to neurodegenerative and neuroinflammation diseases such as Alzheimer’s, Parkinson’s and ALS (Amyotrophic Lateral Sclerosis). Therefore, by supplying glucoraphanin to activate this enzyme, treatment of these diseases is promising. Sulforaphane was found to improve cognitive performance and reduce working memory dysfunction in rats after traumatic brain injury. Consuming a sulforaphane-rich diet prevents memory impairment and increases the survival of hippocampal neurons in diabetic rats. Studies show that sulforaphane from broccoli sprout juice is useful for reducing cartilage degradation. It also influences bone metabolism, and protects against osteoporosis. Women who have menopaused, or have their ovary removed, have low levels of estrogen that often lead to reduced bone mass when uncared for. Sulforaphane promotes bone formation and increases bone density. In a small clinical trial, sulforaphane improved behavior in young men with autism. The magical compound activates genes that protect cells against oxidative stress, inflammation and DNA damage, all of which are associated with autism spectrum disorder (ASD). Participants who received a daily dose of sulforaphane showed significant improvement in both behavioral and communication assessments in as little as four weeks. Some of the positive changes included participants being more relaxed, engaged, more aware, looking others in the eye and shaking hands for the first time. Read more about Sulforaphane and Autism Spectrum Disorders. Oxidative stress due to excessive light exposure can exacerbate a variety of human retinal diseases by accelerating photoreceptor cell death. Sulforaphane protects human retinal cells from UVA light-induced damage. Sulforaphane protects human lens cells against oxidative stress and could potentially delay the onset of cataract. It may also help prevent complications after cataract surgery. Read this story about Rosie Love and her daughter, Imogen, who both healed from cancer by drinking broccoli sprout juice. How Do You Get Broccoli Sprout Juice? 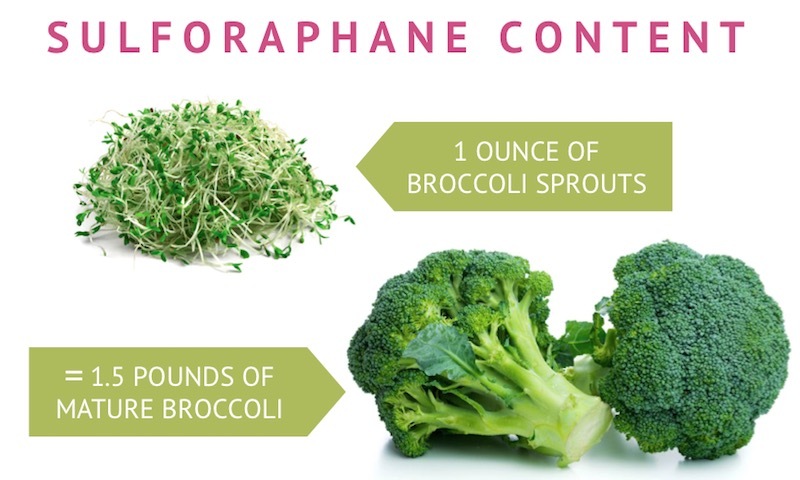 There are thousands of studies done on sulforaphane, and the list of benefits for broccoli sprout juice that has 100x more sulforaphane, is long. Now that we have established its immense health benefits, how or where do we get broccoli sprout juice for daily consumption? You can grow your own broccoli sprouts. Go here, for step-by-step guide on sprouting your own broccoli shoots. 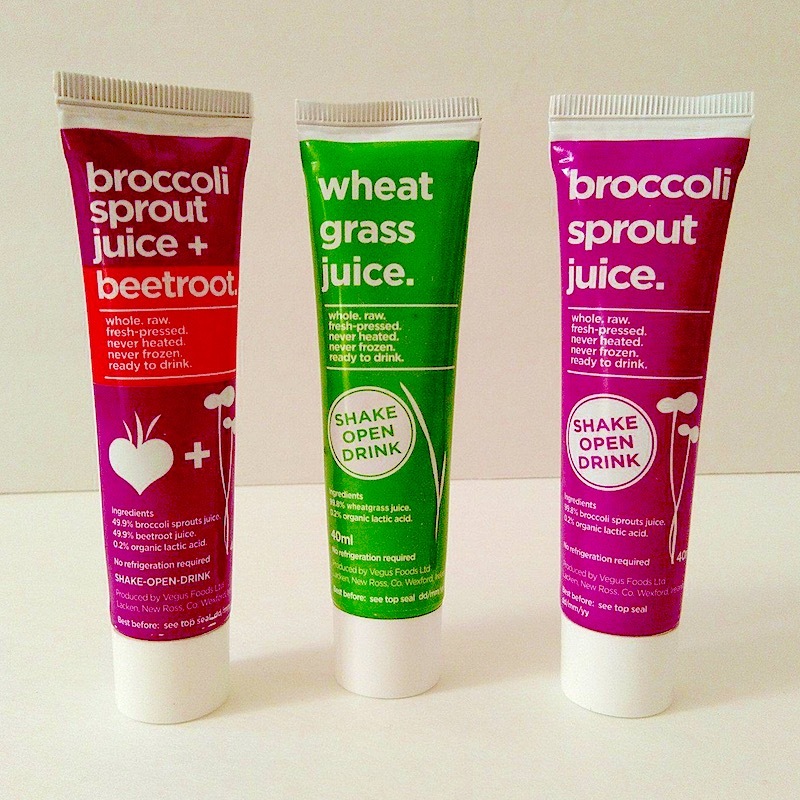 I came across these ready-to-drink broccoli sprout juice and ordered some of them to try. After drinking one tube a day for a week, I can tell you that I feel very energized! Now, a little background about me: I’ve been drinking fresh juices for over a decade now, and have healed from all symptoms (you can read my story here). But if any juice gives me that kind of energy, it must be really something! The best news is that they are inexpensive for daily consumption, considering the powerful sulforaphane that fights cancer like no other food! Vegus Juices is the only company in the world that makes broccoli sprout juice with the highest source of sulforaphane at about 100 micromoles a tube! The broccoli sprout juice comes in individually-packed 40 ml tube size that preserves the nutrients and enzymes (especially sulforaphane) in such a way that it needs no refrigeration, yet has a shelf life of up to 26 weeks (6 months). To buy these ready-to-drink broccoli sprout juice, go here >> and tell them Juicing-for-Health.com sent you! Vegus Juices also prepares wheatgrass juice and broccoli sprout + beetroot juice. All prepared by cold-press, never heated, never frozen and using high pressure processing that gives their juices a 6-month shelf life without refrigeration. Consume broccoli sprout juice that contains more sulforaphane in fighting cancer. Mother and daughter healed from cancer by drinking broccoli sprout juice. Broccoli sprouts juice for the treatment of Autism Spectrum Disorders (ASD). How to grow broccoli sprouts at home for an anti-cancer diet.